Sony's next lineup of Xperia smartphones is expected to be revealed in late August or early September at IFA 2017 trade fair. Two of these new devices are supposedly called Xperia XZ1 and Xperia XZ1 Compact. For the time being, they are known as Sony G8341 and G8441. The former is believed to be the regular Xperia XZ1, while the latter is likely to be its smaller brother. Early this month, the Sony G8441 was spotted at AnTuTu, a benchmark that keeps an updated database of test results from a multitude of smartphones. Based on the information listed on AnTuTu, we've learned that the G8441 sports a 5-inch display, but a powerful Snapdragon 835 CPU under the hood. 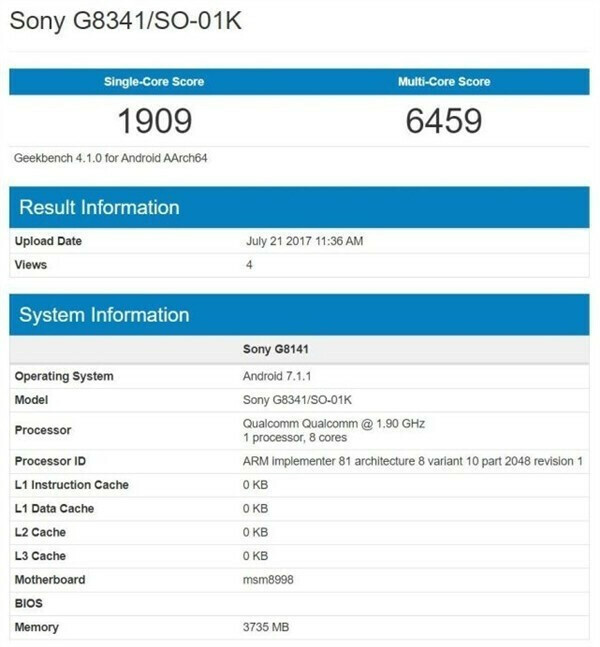 This week, the other upcoming Sony Xperia smartphone appeared at Geekbench. Unfortunately, due to the nature of the benchmark, we're only able to learn information about the phone's processor, the amount of memory and the software it runs. As expected, Sony Xperia XZ1 will be equipped with a powerful Qualcomm Snapdragon 835 processor, coupled with 4GB RAM. Also, the phone will run Android 7.1.1 Nougat right out of the box. The rest of the phone's specs remain a mystery for now, but with about a month until the official reveal, we believe there's enough time to found out more about Sony's next flagship smartphone. It is fake actually ... Look below System Info It is written G8141 , code of XZ Premium. G8341 has android 8.0. CPU might be 836 instead of 835. G8441 will run 8.0 too .... G34XX has the 660. No one cares about this bricky infamous toy. It's not gonna be worth buying a Sony product. You cared to share your s**tty posts. Oh but he speaks the truth. Look at this years smartphone designs. Most major smartphone companies are now making a bezel less smartphones. Even the rumors of the upcoming iphone 8. Shows a borderless design. Meanwhile, Sony smartphone designs has been stuck since the xperia Z line. Even the internal storage for their flagship smartphones are too small. Compared to samsung galaxy S8+ and note 8's asus zenfone ar's 128GB model or the 256GB iphone 7 and 7 plus. 64gb is standard now on Xperias and they don't create 128gb variants because there's not enough demand for it. Better looking than nasty ugly loooooonng taaaallll naaarrrooww tv remote control curved phone. You be got some ugly taste. Your Tv at home must be not rectangular but curved like Apple tv? Don't you realise how ugly a tv looks when it's not rectangular. Just look at Sony's 9 series Lg oled Samsung 9 series with no bezel and pure monolithic design. Dumbass hypocrite you know when it comes to design Sony is the master. There are a lot of things I like about Sony phones, from their software, to their design design language (which I love), BUT, the bezels are really just too big at this point. I really hope they turn it around soon and put out something that will turn people's heads again. I think at IFA's when Sony will bring their first bezel-less phone as much sources has confirmed previously . But we have just to wait for the official confirmation though . That 6 in screen from JDI is for Mate 10. XZ1 looks exactly alike XZP, but a bit smaller bezels. Not G6 style.